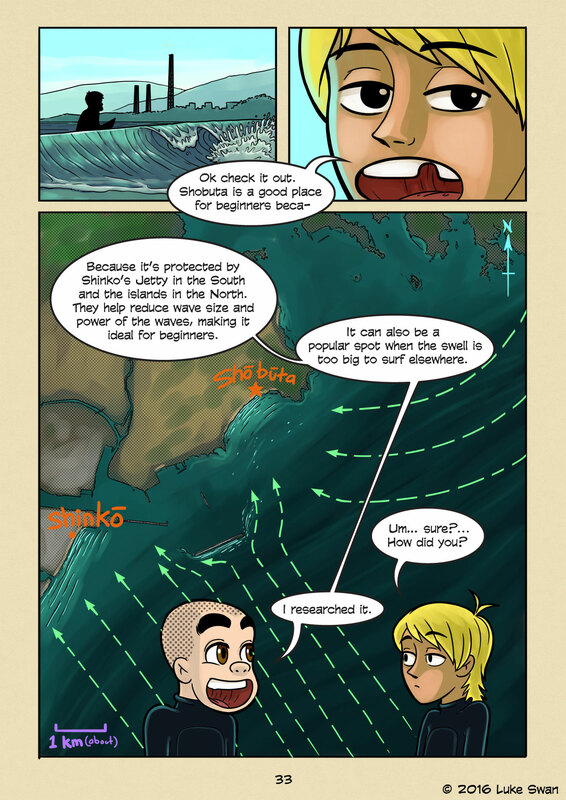 Shobuta Breakdown (#033) | Web comic "Surfer Joe"
This is the first spot breakdown for the comic. Hopefully the first of many. It’s not the most in depth breakdown, but hopefully gives the reader an idea of how the Shobuta break works, without taking too much time away from moving the story forward. Most surfers are amateur weathermen, with more than a few of them being experts. Their schedules revolve around the ocean, so the study of waves, breaks, and storm systems becomes a side hobby. It’s pretty rewarding to keep your eye on reports and see storms develop out at sea. When you time it right and hit the beach on a good day, it feels great. When I was first starting out, I’d just show up at the beach every chance I got. I’d paddle out no matter what the waves were doing. I didn’t understand when the other surfers would complain about the waves not being very good. They always seemed fun and fine to me. But once I got more experience I began to see what they were talking about. Dumpy closeouts were less fun, as were mushy fat burgers. And showing up at the beach to find poor surf started to get frustrating. So I started to pay more attention to weather reports and storm systems. And I learned about swell height and period. Swell height is pretty self explanatory, . But swell period is a bit more interesting. It’s basically the space in between waves. The longer the better. If you have a long period swell, the wave quality is much better, and the waves can be pretty big even if the swell height isn’t. Do you like the spot breakdown? Would these be something you would like to see expanded on? Let me know in the comments!